Noor Hussain – Inovestor Inc.
One of the companies mentioned in this week’s Globe and Mail article where we focused on 2 non-cyclical US sectors, namely, Utilities and Telecommunications, will be covered in more details below. 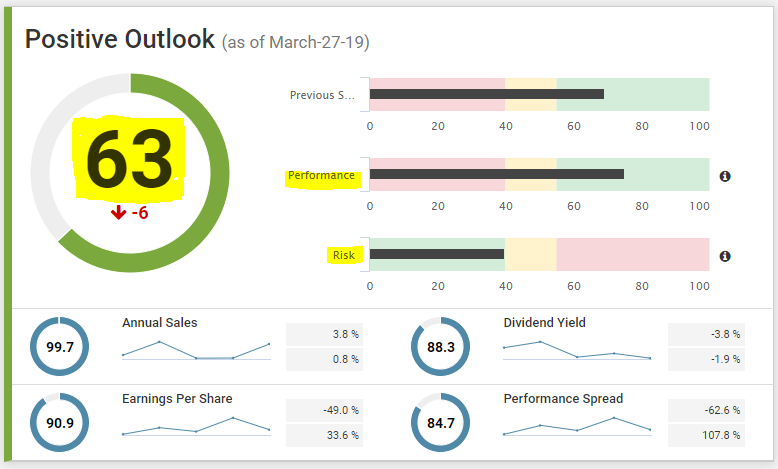 As we can see from the Scorecard, Verizon possesses a Positive Fundamental Outlook and an attractive SPscore of 63%, where the Performance score is in the green shaded area, whereas the Risk score is very close to the yellow shaded area- representing a medium risk for the company. 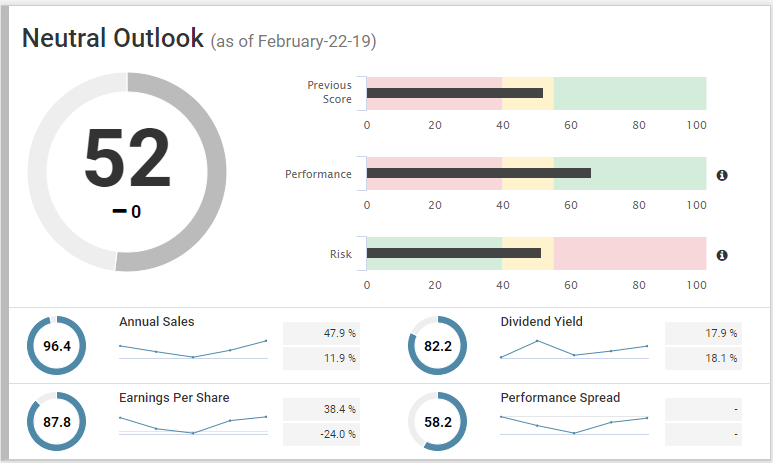 The 6% decline in score marked below the SPscore, is either due to a fall in performance or a rise in risk since last quarter. We know that the Risk score is affected by 2 main metrics which are the Price over Intrinsic Value and the Future Growth Value. 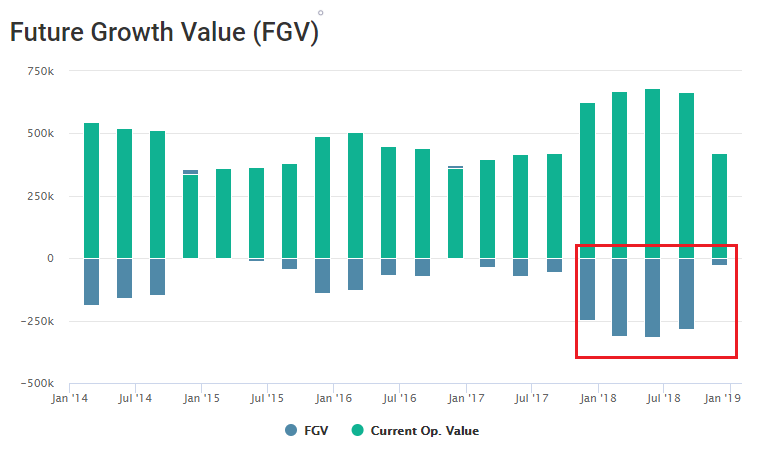 On the scorecard, we can see from the FGV graph that while the stock is still trading at a discount, the discount has decreased over the recent quarters. Therefore, increasing the risk slightly. 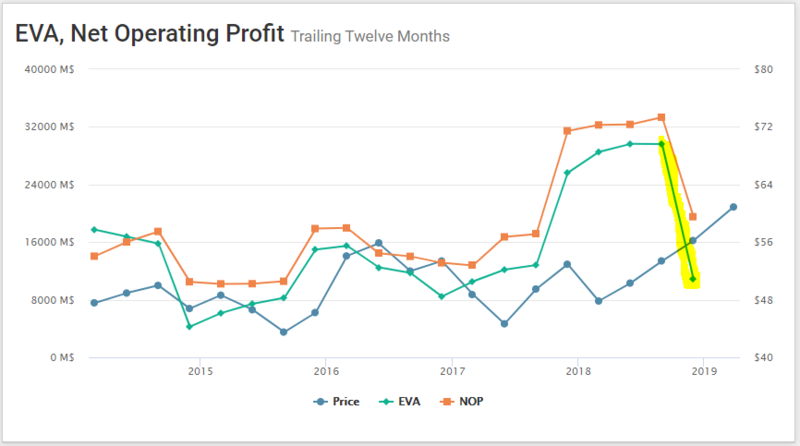 As for the Performance, we look at the EVA graph, EVA seems to have suffered tremendously just by looking at the graph below. That is actually not the case if we take a deeper look at the numbers. Due to the tax cuts that took place in 2017, the EVA was artificially inflated. Verizon and many companies benefitted when their profits were boosted due to the cut. That effect, however, was reversed back to normal in December 2018 when the real taxes were reported and thus creating the sharp fall in EVA seen on the previous graph. The S&P/TSX Total Return Index increased by 3.1% in February, adding to the strong January returns (8.1%) and leading to a YTD return of 12.2%. This gives the Canadian market a very strong start so far in 2019 which has actually slightly outperformed the MSCI Global (11.2%) and the S&P 500 (11.8%). Most sectors of the Canadian market were positive contributors in February, with Information Technology being the strongest one at an 8.4% increase. The Canadian central bank & the FED comments have remained highly constructive for the equity markets. Although some analysts were expecting a more hawkish tone for the future, central banks have not indicated such act. Furthermore, the overall earnings and guided earnings have been positive over this period. In addition, commodity prices, including energy and metals, have been stable which is crucial for the Canadian market. Finally, Canadian banks’ results were in-line to slightly below expectations, except for BMO, that came higher than expected. Our Nasdaq Inovestor Canadian Equity Index (NQICA) rose by 2.1% in February, leading to a YTD positive return of 10.7%, slightly underperforming the market. Looking at contribution factors to the NQICA returns, the best performing stock up 14.6%, was Constellation Software (CSU), that outperformed earnings expectations. On the contrary, the worst performer was CCL industries (CCL.B) which was down 3% in February as a result of weaker than expected results. As mentioned, in the Globe and mail article – Canadian Natural Resources Ltd (CNQ) seems to reflect improving and promising performance. 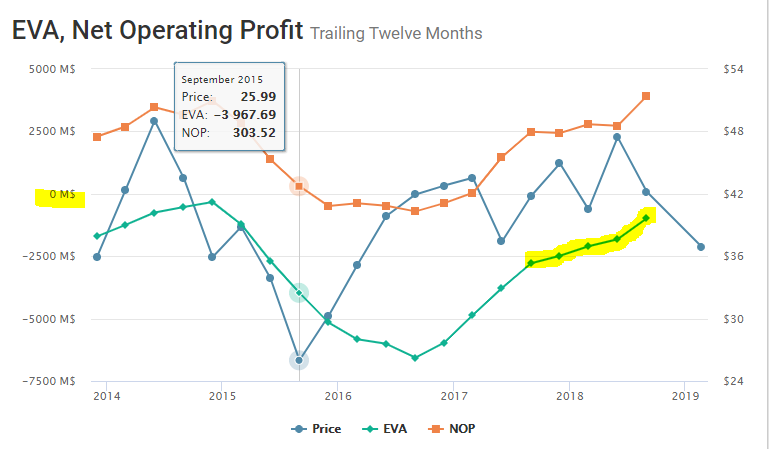 However, it is important to note that the EVA is still negative, meaning CNQ is still not adding value to its shareholders and this is due to the company’s high cost for raising capital. 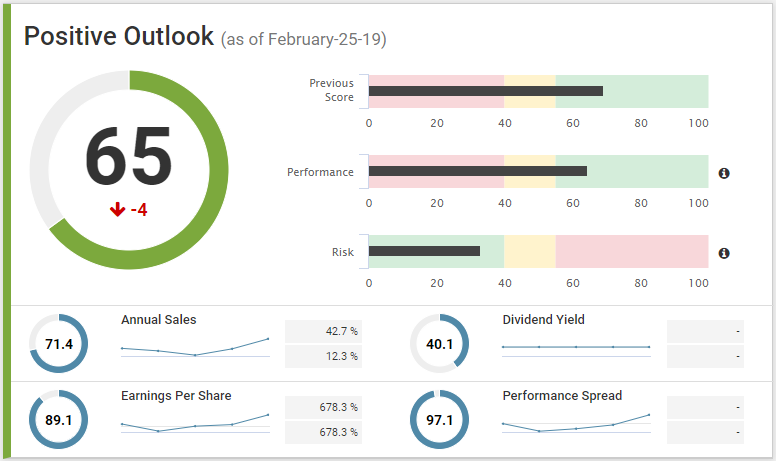 Although that difference is decreasing (due to a greater increase in profits than an increase in capital costs), it is not yet eliminated, hence why CNQ is still risky (given by the 51% risk score seen on the Scorecard) and signals an overall neutral outlook. 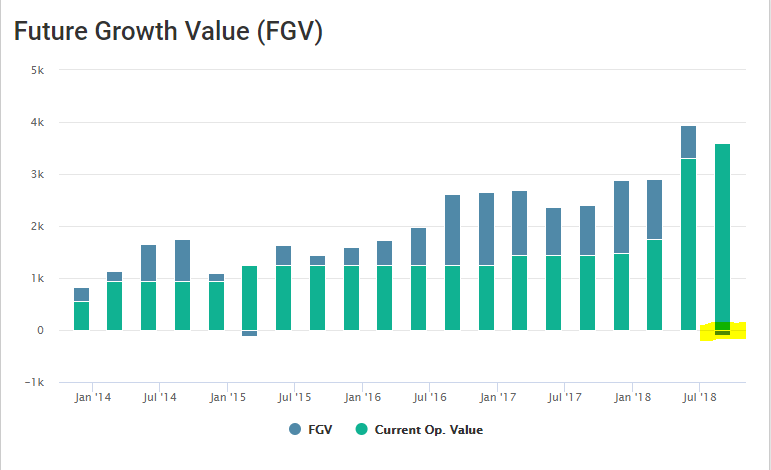 The FGV is negative indicating a discounted stock valuation. For subscribers to StockPointer, you can select the link below and adjust the screener to your liking.